Current Design Sheet in progress. Old Design sheet available under Win Pose. A mountain of muscle with a kind heart, Tsumi Watenabe is genetic oddity on a rather large scale. Her impressive stature doesn't stop her from being polite and trying her hardest not to scare people with her tremendous size. People tend to be frightened simply being near her, and often mistake her for a guy, so she tries to introduce herself as non-threateningly as possible and dyes her hair blue. It doesn't always help the situation though. Her uncommon height is actually thanks to the genetic abnormality, Gigantism, which normally causes excessive and debilitating growth of certain parts of the body. 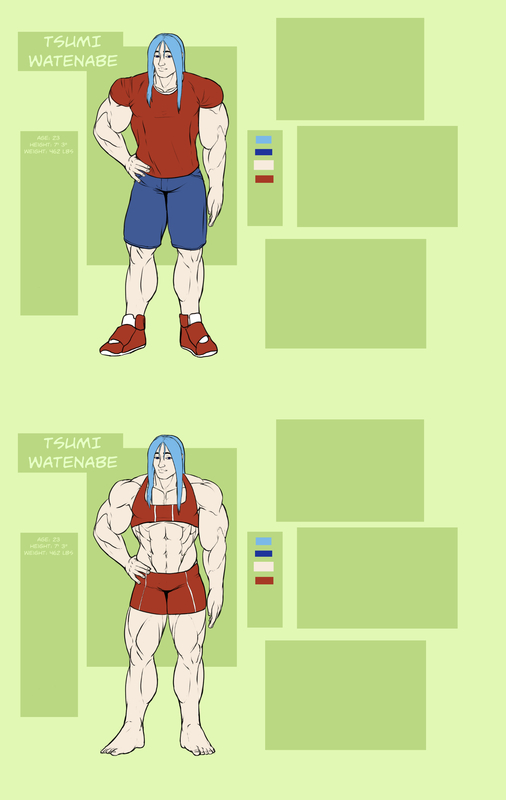 Tsumi was incredibly fortunate that thanks to medical science and quite a bit of luck, her body has managed to grow at a nearly ideal scaling. Her skeleton, organs, and musculature all increase at a remarkably synchronized rate. But that only explains her height. Tsumi's muscles, or her "Width" is pure exercise, devotion, and a whole lot of time in the gym. Thanks to a traumatic experience when she was young, Tsumi makes a significant effort to make sure she is strong enough to handle anything that might put her, those she cares about, and particularly her sister, Sasami, in danger. What that might be, she doesn't know, but she works out to habitually to be prepared for it. She has done so to the exclusion of other pursuits however; she doesn't have many friends or much of an education beyond high school, and she is rather naive. She has a strong moral compass, readily stepping in to help others or confront people who may be committing crimes, much to her sisterï¿½s dismay since she ends up in the hospital often. Tsumi can't seem to help ending up in fights, especially here in void, but isn't really well trained in combat. Little more than a brawler, she throws punches, kicks, tables, and eventually herself at enemies with little regard to collateral damage. Despite her size, she's outclassed here in void city, where people have super powers on a regular basis. Tsumi isn't super strong or invulnerable, she's just really strong for a normal person. Where a superhero could easily lift a bus over their head, Tsumi can just manage to lift the back end of a Volkswagen off the ground. It doesn't stop her from blindly charging in, determined to set things right and keep people safe. Tsumi's younger sister, Sasami is a cold, calculating and efficient woman, who works as an accountant and finance consultant for a variety of companies. Her skills come at a high cost but the information she gathers can be invaluable. However, this is how the world sees her behind her sunglasses. In reality she's a terrified, paranoid, and quite easily scared little girl, who relies on her shades as sort of a security blanket to keep her calm. They only go so far, as the only person Sasami trusts is her older sister and needs Tsumi's rather constant care to prevent her thoughts from spiraling into a paranoid episode thanks to the incident where she was kidnapped and held ransom at age six. Unlike her older sister, Sasami has no issues with solving a problem with murder, and carries a pistol in her jacket, and one in an ankle holster. In just under a year since moving to Void city, Tsumi has made quite a few friends most of them people she ended up fighting against prior, such as Beo. Tsumi currently works at the Horizon Shipping Yards under Veronica Nightingale. She also trains at the Kagaku-ryu Science Dojo owned by Master Hakase. Although her intents have been good, Tsumi has ended up with a rather long list of minor crimes, mostly property damage. The events of Upheaval, the battle between Caelum and Lithium, have left Tsumi in strange place between political powers. Supporting friends she's made on either side has become difficult, on top of her Gigantism finally catching up with her and making some daily tasks strenuous on her massive frame. Tsumi hasn't heard a word from her sister since the event, but she's just as unsure what to say when they eventually meet again.